Clint Audio Odin review | What Hi-Fi? It’s not often a manufacturer evokes the might of Norse gods, but that’s exactly what you get from the Clint Audio Odin. 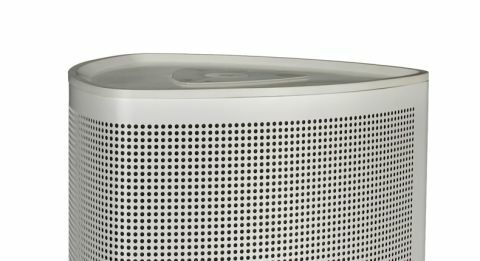 The Danish brand has experience in DAB and internet radio technology, and is now invading the UK with its Asgard series – a three-strong range of wireless speakers. In keeping with Norse mythology, Odin is the big daddy of the family. Standing at nearly 40cm tall, it’s bigger than it looks. It will certainly take up a lot of desk space, which is why Clint Audio recommends that it should live on the floor instead. There’s an easily assembled stand, which lifts the Odin off the floor by 5cm and tilts it upwards by eight degrees, but this is sold separately for £46. We have mixed feelings about the aesthetics. There’s something smart and neat about the rounded triangular design, but our white version looks like a portable air conditioning unit. Thankfully, you can also get it in dark grey, which is a lot cooler. Thankfully, the specs list is more impressive. The Odin is a stereo speaker with 2x25W of Class D amplification and a bass reflex enclosure. It has a smörgåsbord of wireless skills: over a wi-fi network, it can handle AirPlay, Spotify Connect, DLNA streaming and internet radio. Sadly there is no Bluetooth, which is a shame. If you have multiple Asgard wi-fi speakers, you can set up a multi-room system, or just use a pair for a stereo set-up. If you don’t have a wi-fi network, you can use wi-fi direct, which lets you send music directly to the Odin. If that’s not enough, you can go down the cable route, with USB (for iOS devices) and 3.5mm inputs. As is now common with wireless speakers, there is no remote control. There are a few buttons on top, but mostly you will control the device with the free Clint Asgard app for Android and iOS. Setting up is a matter of connecting to the Odin by wi-fi and using the app to type in your network login details. The app is cleanly designed and easy to navigate. Besides some basic track and volume controls, you get to choose input and speakers, and activate/deactivate the multi-room feature. You’ll also find options for settings (simple tone adjustments) and firmware updates. Connectivity is a mixed bag. Even when the speaker was connected to our smartphones, it often wouldn’t show up on the app. The Odin was also fussy when we tried playing from networked storage devices. We could connect and even browse through our albums, but sometimes songs would not play, suggesting that either the Odin or the app isn’t fully sorted. However, we had no issues when playing by wi-fi direct, Spotify Connect or Apple Airplay. Once connected, the Odin puts out a thunderous bellow – as you’d expect from something named after Thor’s dad. It’s big, there’s plenty of bass and it has no problems filling larger rooms. The spread of the sound is very wide, no doubt helped by the triangular, sideways-firing design. The speaker is meant to work off your walls, with the recommended placement being in a corner. For the best spread, use the dedicated stand, which lifts the presentation significantly. Bass goes impressively deep, there’s a good amount and it’s fairly well defined. It’s a weighty sound that nobody could accuse of being insubstantial. Elsewhere, there are a few issues. The Odin is tonally uneven. The upper bass part of the frequency needs more energy and the treble could do with more precision. In the midrange, voices have a hollow, boxy quality. On the subject of dynamics, the Odin does not punch as hard or as firmly as similarly priced rivals, such as the Geneva Model S Wireless DAB+ and the Libratone Zipp. For the money we’d expect an almost seamless wireless experience, if not a better sound. And that stand really ought to be included in the price. Sorry Odin, you won’t be packing your bags for Valhalla just yet.